You want these special Black Friday deals for designers? Attention web designers and developers. Black Friday is upon us, and it’s your turn to participate in the fun and excitement. We’ve put together nine attractive deals just for you. In fact, there is one or more you’re certain to want to take advantage of while they’re available. You’ll have to hurry though, as Black Friday only makes an appearance around this time of the year. It’s not simply a matter of discount prices either. These top products will increase your productivity and the quality of your deliverables. Moreover, they will make it easier than ever to meet the most stringent deadlines. What are you waiting for? Hop on board! wpDataTables is an absolute whiz at creating responsive tables and charts. This #1 WordPress plugin is so fast, efficient, and easy to use, that some users have switched over to the WordPress platform to use it. In fact,wpDataTables has over 13.000 paying users, with an average customer rating of 4.6. No coding is required on your part. You can create your tables and/or charts with just a few clicks. wpDataTables not only works efficiently with large MySQL tables, and can in fact, easily work with huge amounts of data; we’re counting millions, not hundreds of words. Since frontend editing is allowed, it’s easy to make changes to a chart or table as you proceed, or update one that has already been published. You can sum, average, show minimums or maximums, and perform other calculations; and if you want to highlight a few things, you can highlight rows, columns, or individual cells, based on the content type. wpDataTables is a handy tool to have when you’re working on price lists, price comparisons, inventories, and most other collections of data. On Black Friday, this plugin is yours at a 50% discount, from Tuesday, 21st till Wednesday, 29th November 2017 (2pm AEDT). Whether you’re a Webflow user or not, the company is offering its HTML5/CSS3 responsive websites at a 75% discount on Black Friday only. There are more than 100 templates to choose from, including templates for blogs and portfolios. This is a great opportunity to learn more about Webflow if you are currently using another design platform. 380,000+ designers and developers, along with other creative types, currently use Webflow – and for a good reason. Since Webflow allows you to design and develop at the same time, you can build a website in half the time you’ve become used to, and probably less. Better yet, no coding is required on your part. The 100+ templates give you plenty of design options, but if you prefer, you can also start from a blank canvas. Nutcache is designed to help teams manage a project from the time initial planning and estimates are underway, throughout the project lifecycle, and up to the final billing. Teams following Agile/Scrum principles and processes will find this web app particularly helpful. Nutcache fully supports any Agile methodology, while providing the necessary flexibility to adjust to a team’s workflow. A key feature is the inclusion of financial capabilities into the project lifecycle, thereby providing greater business value. To celebrate Black Friday, new customers can realize a 40% discount on the Enterprise edition, Nutcache’s most powerful Agile solution. This offer applies to yearly subscriptions only. Those taking advantage of this offer will pay only $15/month for up to 6 users, as opposed to the usual $25/month. TheGem provides you with the ultimate toolbox of web-building features and design elements created by start designers from Behance community. Since no coding is required, you can spend your time exploring your creativity, and building impressive websites in minutes. On Black Friday only, you can purchase this carefully-crafted Swiss Army Knife of WordPress themes, with more than 70 unique multi-page design concepts, all the premium plugins and 150 demo pages at a 50% discount – just for $29. The ListingPro Directory WordPress Themeis unique. It’s the only end-to-end WordPress Directory All-in-One Solution on the market today. It’s also the number 1 best-selling product market fit in ThemeForest’s Directory and Listing category. Its Core Value? No paid plugins are needed. Everything’s inside, and it can be yours at a 50% Black Friday discount. Themify is a great source of themes, plugins, and addonsto help you build beautiful websites easily and quickly. These products, and Club memberships, can be yours at 50% off by using promo code BLACKFRIDAY. In addition, you can join the Lifetime Master Club for only $199, a $150 discount, using promo code BFLIFE150. These offers are good through Cyber Monday. You also have a chance to win a $150 Amazon gift card and a Master Club membership during this period. This website, app, and database builder makes it easy for you to manage your business from a single platform. Simbla allows you to use various applications such as eCommerce, CRM, blog, and more. You can edit all aspects of the user interface and create your own database-driven apps. Get Simbla at a 50% Black Friday discount. 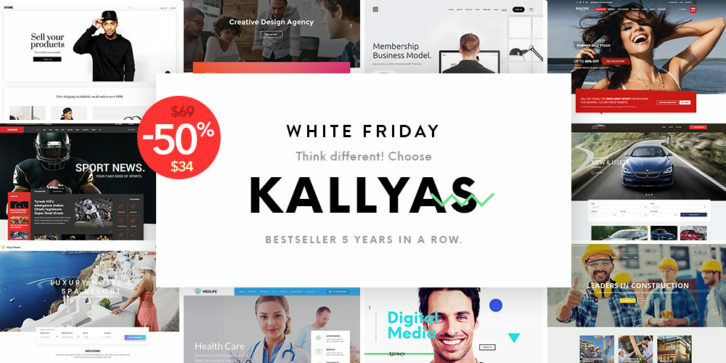 Kallyas is a superfast ThemeForest best seller. It’s built around the Bootstrap frontend framework, which accounts for its great performance, and it brings to the table a wealth of page elements and options that enable you to create fast, responsive, high-performing, SEO friendly websites in no time at all. All that, plus top-notch support, can be yours at a 50% discount to celebrate Black Friday. Black Friday is around the corner and Stockfresh has an irresistible offer for you! Every web designer and developer needs high-quality stock photos and vectors at hand – and Stockfresh offers them at a very hot price! Make sure you grab your piece of cake with the code BLKFRD17 at checkout for 20% discount on every plan. How did you like these nine great Black Friday bargains? it is certain that one or more of them might fit nicely in your website design/development toolkit. Black Friday provides a great opportunity for bargains. The discounts offered here should be hard to pass up, given the quality of the products involved. Take a close look at whatever interests you most. Then, you can rest assured you’ll be glad you did once Black Friday is in your rearview mirror.